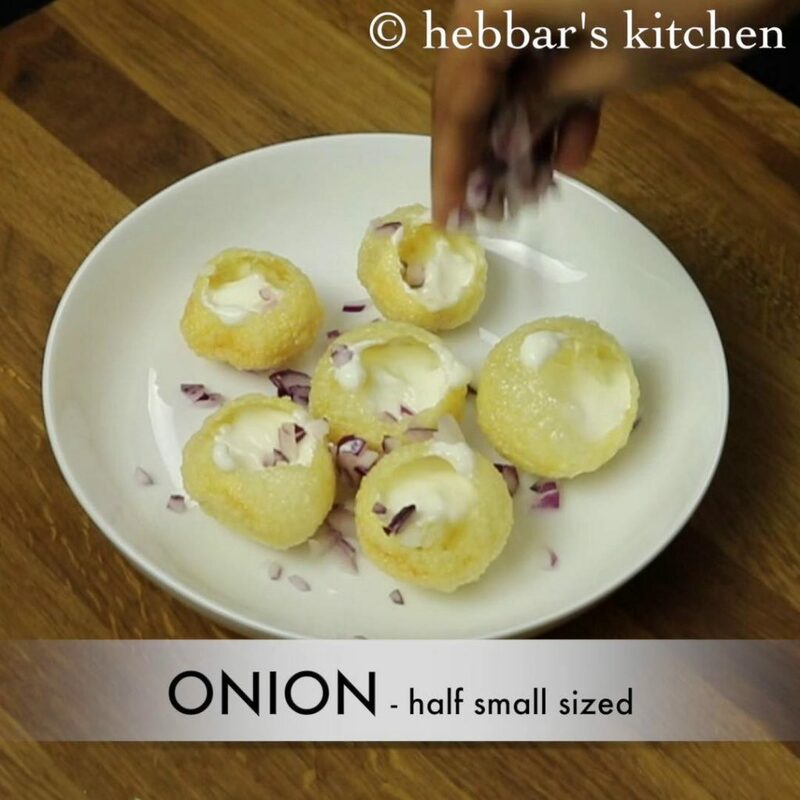 dahi puri recipe | how to make dahi batata puri recipe with detailed photo and video recipe. 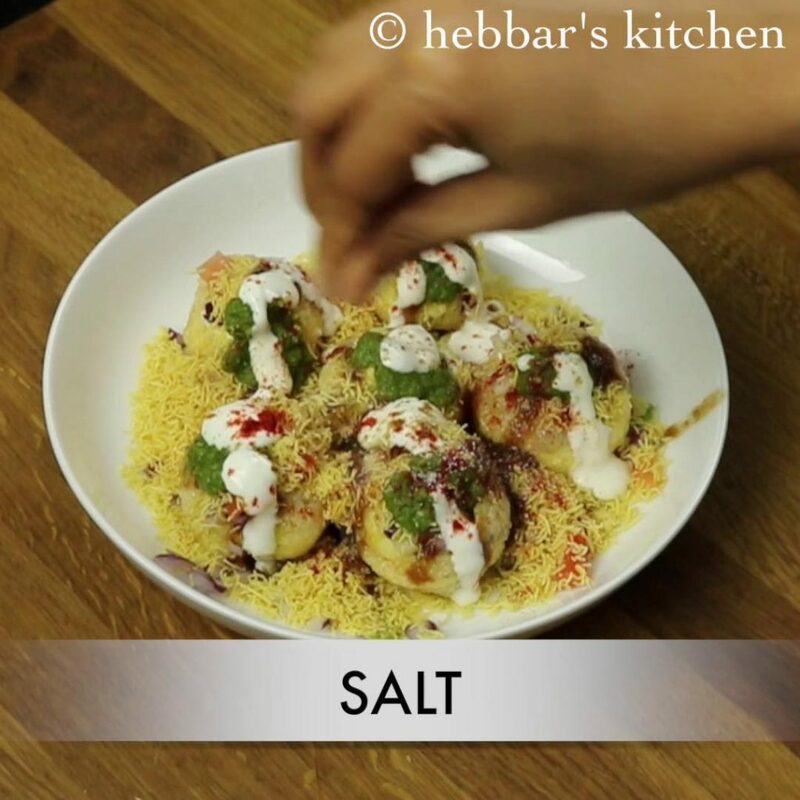 a popular indian street food chaat recipe which is prepared very similar to sev puri, but filled with sweet yogurt and other chaat chutneys. 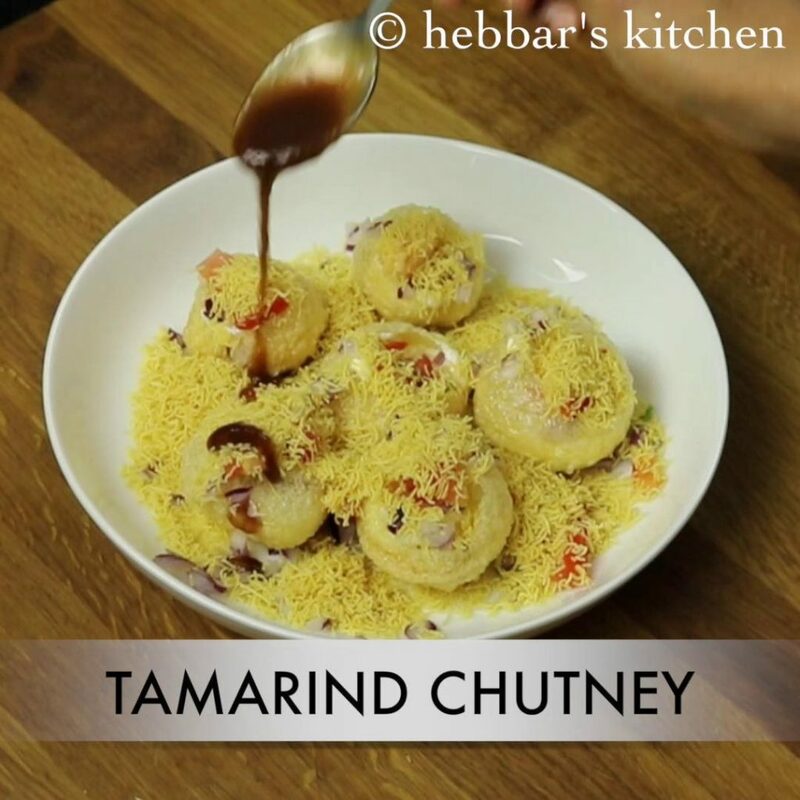 it is typically consumed as evening snack and perhaps as a dessert after other chaat recipes. 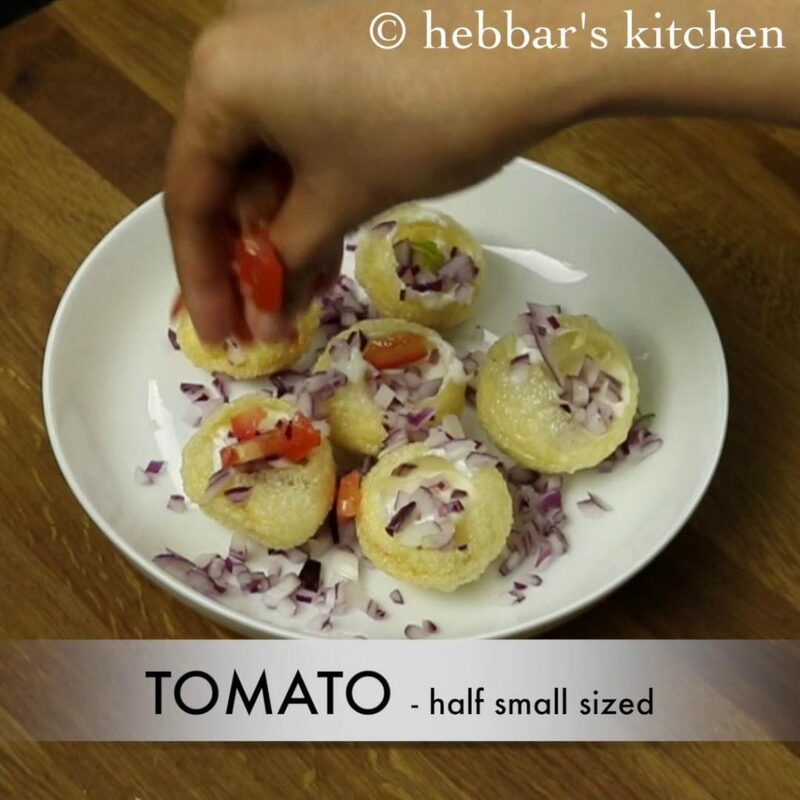 dahi puri recipe | how to make dahi batata puri recipe with step by step photo and video recipe. 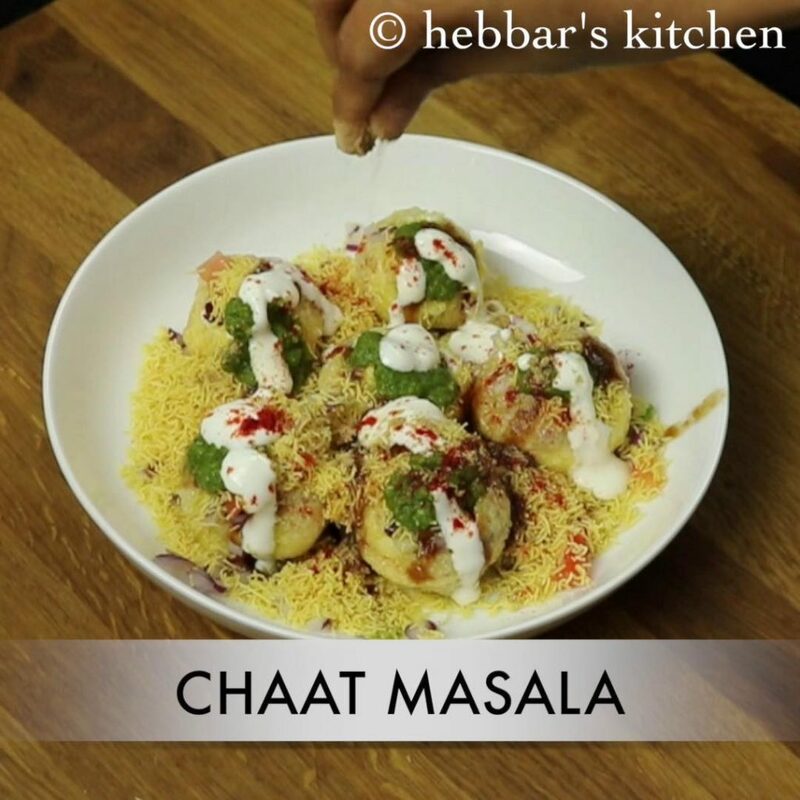 a sweet and spicy, yogurt based chaat recipe which is typically consumed after other spicy chaat recipes. 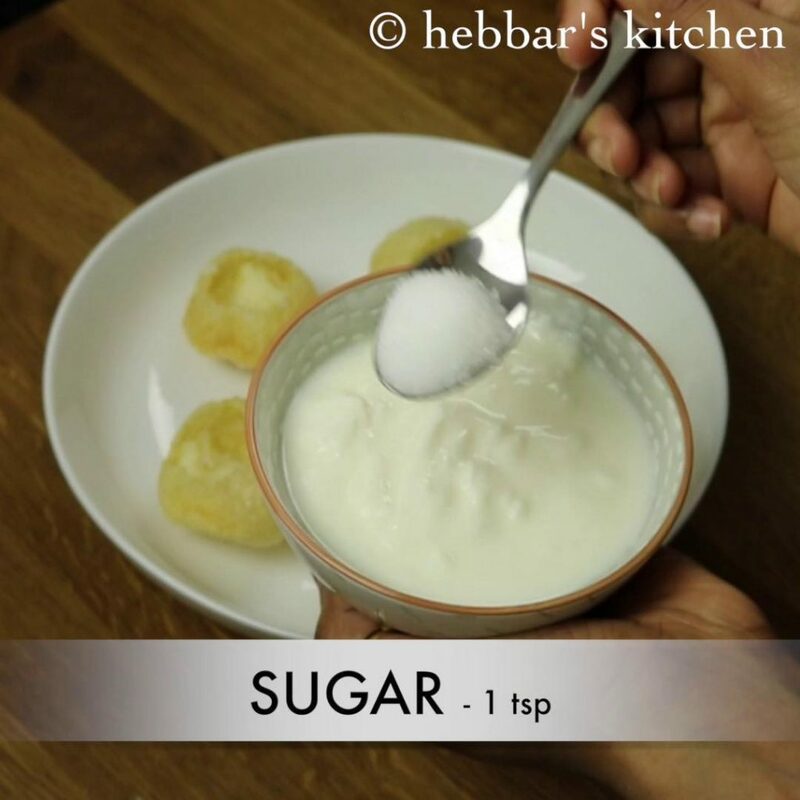 perhaps, because of the sweet and sour taste of yogurt makes dahi puri as a dessert chaat recipe. 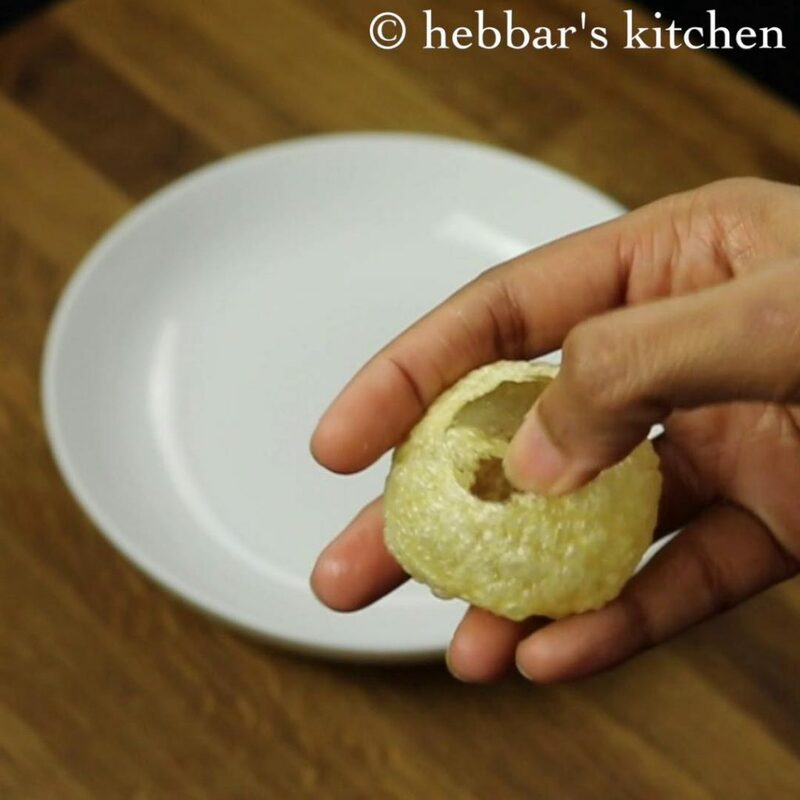 it is usually served with mini puri or the golgappa puri which is used in pani puri. while i am not huge fan of dahi puri recipe, my husband just loves it. 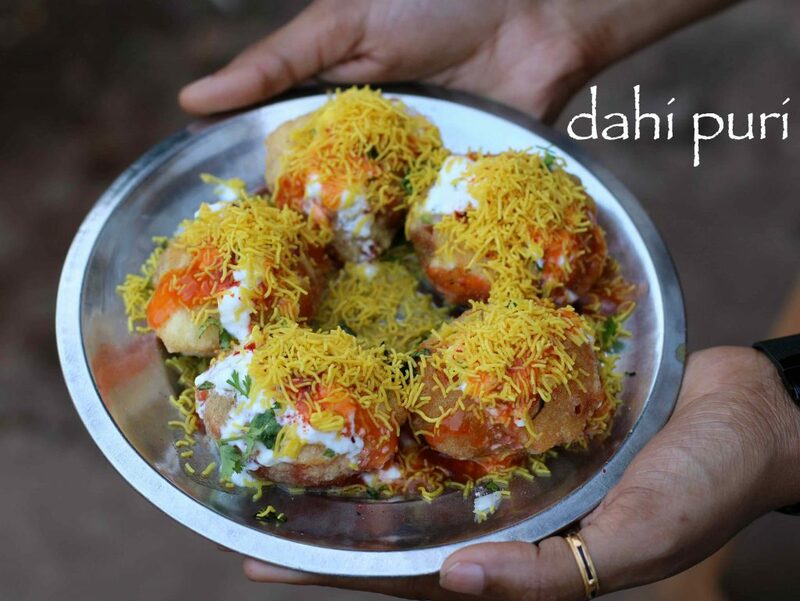 i settle for sev puri recipe, but dahi puri is a must chaat recipe for my husband only after pani puri recipe. 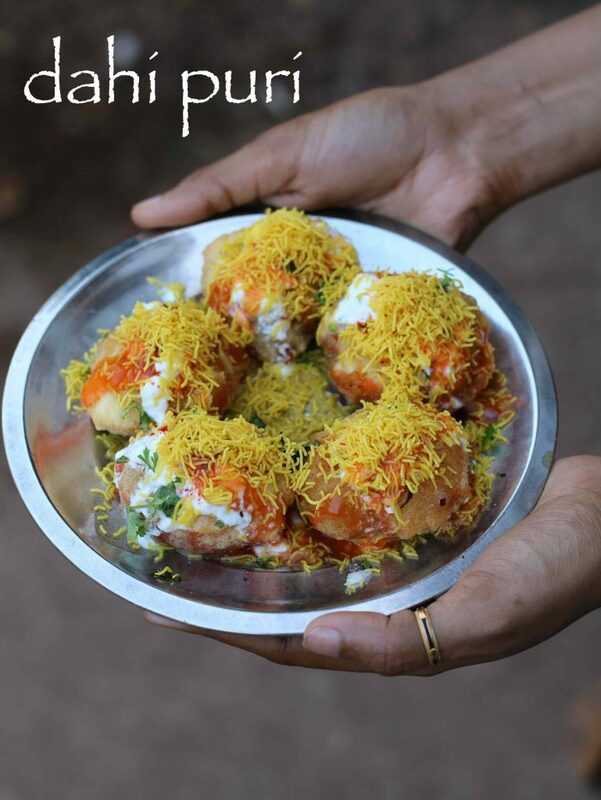 perhaps he likes it because of sweet taste it has to offer especially after spicy pani puri or bhel puri. 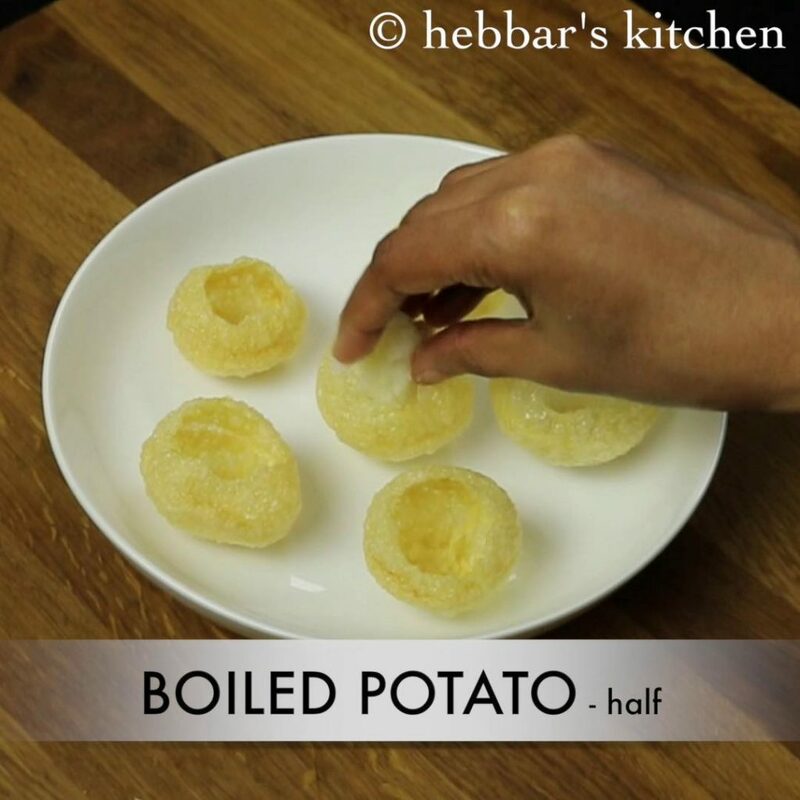 hence i prepare dahi batata puri quite frequently and make sure to fry some extra puris for him. a typical serving of dahi puri mainly consists of curd, green chutney, tamarind or sweet chutney and finely chopped onions and tomatoes. firstly the puffed puri’s shell is broken at the top and is filled with mashed potatoes. it is then followed by sweet dahi and finely chopped onion and tomatoes. once the puris are overflowing with dahi, add green chutney, tamarind chutney and some fine sev. finally sprinkle some chaat masala, red chilli powder and salt as per taste. firstly, make a hole at the centre of puri with your thumb. further, stuff half tsp of boiled potatoes into each puris. furthermore, take a cup of curd and mix sugar in it. also add generous amount of sweet curd into each puris. sprinkle generous amount of chopped onions. also sprinkle and spread chopped tomatoes. furthermore, top with generous amount of thin sev. then pour and spread tamarind chutney. 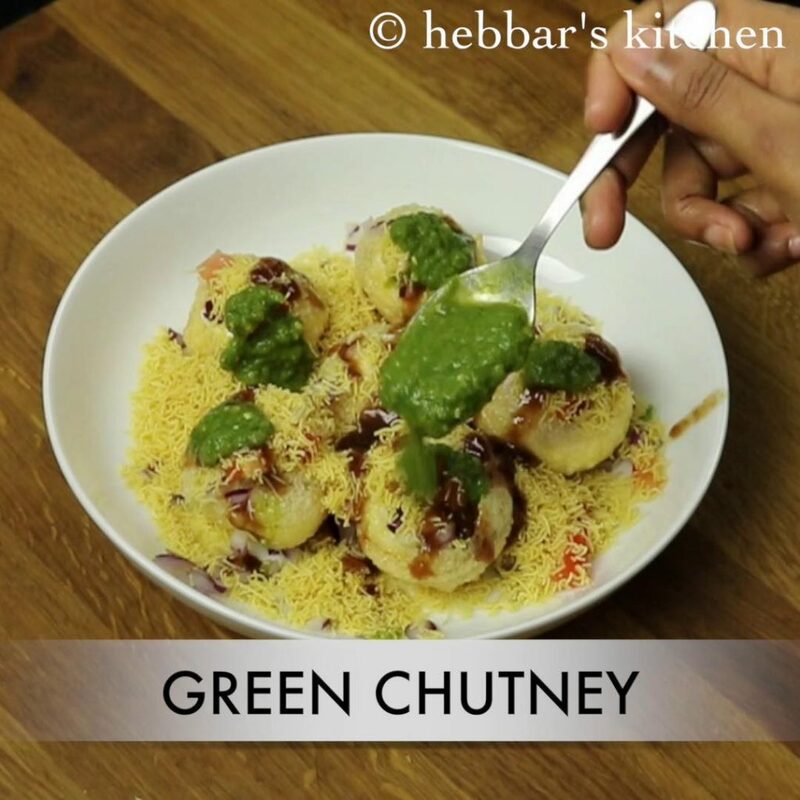 further add green chutney onto each puri. then also top with a tsp of curd. sprinkle chili powder, chaat masala and black salt or cooking salt. 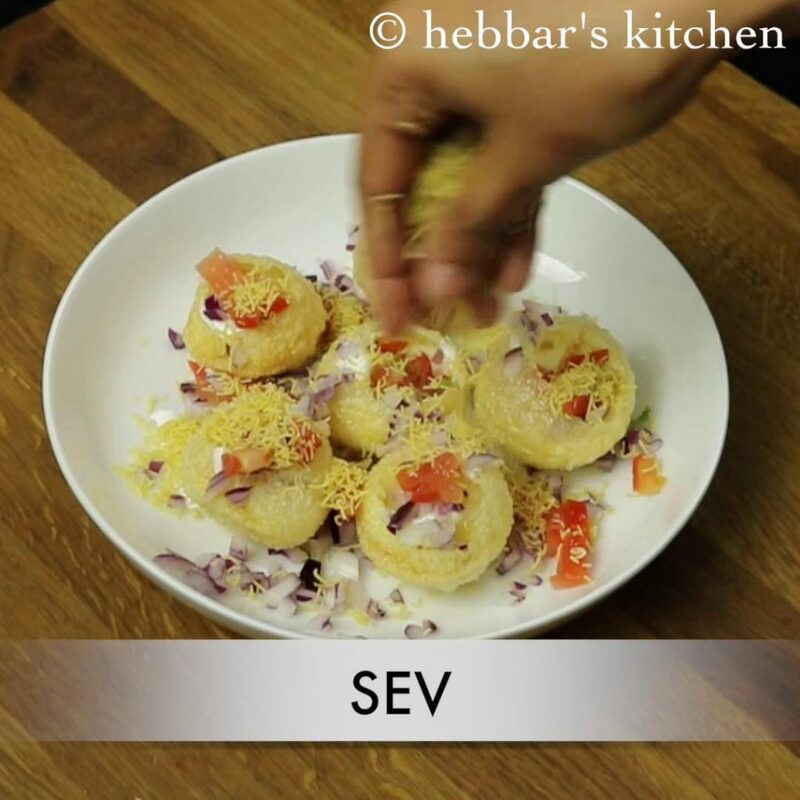 finally, garnish with coriander leaves and serve sev puri immediately. furthermore, take a cup of curd and mix sugar in it. else the curd will be slightly tangy. 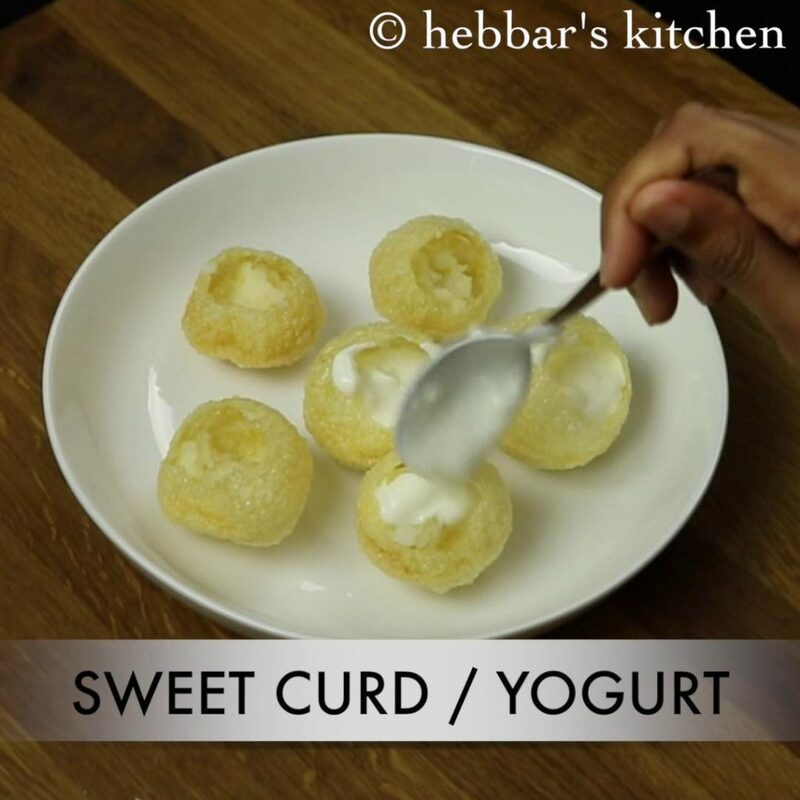 sweet curd taste great for dahi puri. then pour and spread tamarind chutney. you can also use sweet dates tamarind chutney. then also top with a tsp of curd. however it is optional. 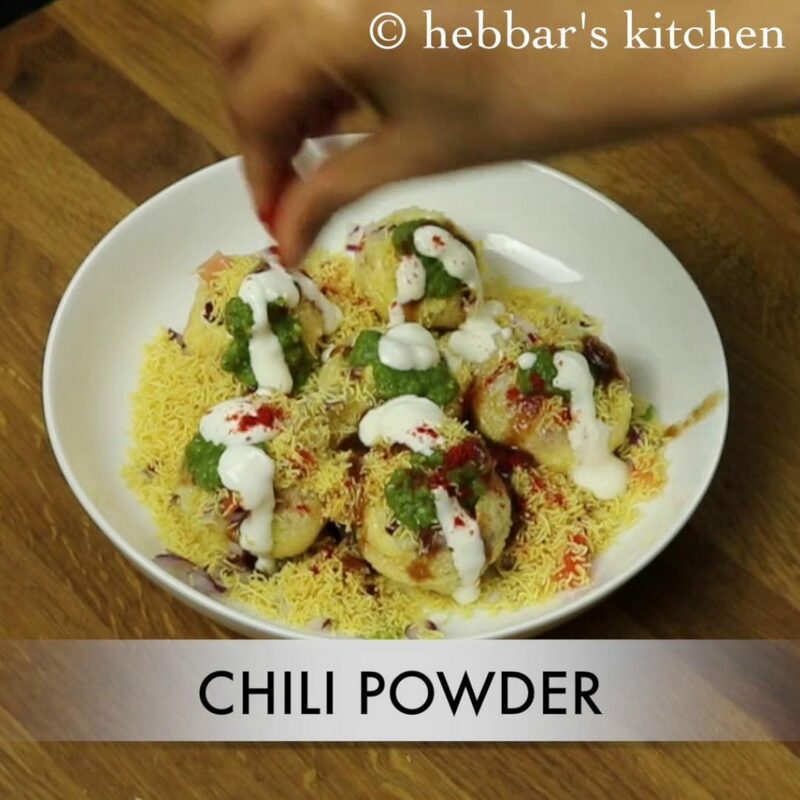 sprinkle chili powder for slightly spicy dahi puri. furthermore, sprinkle chaat masala for more tangy and chatpata flavour. also season with a pinch of black salt or cooking salt. finally, garnish with coriander leaves and serve dahi puri immediately. firstly, use crispy and large puris for greater stuffing and taste. 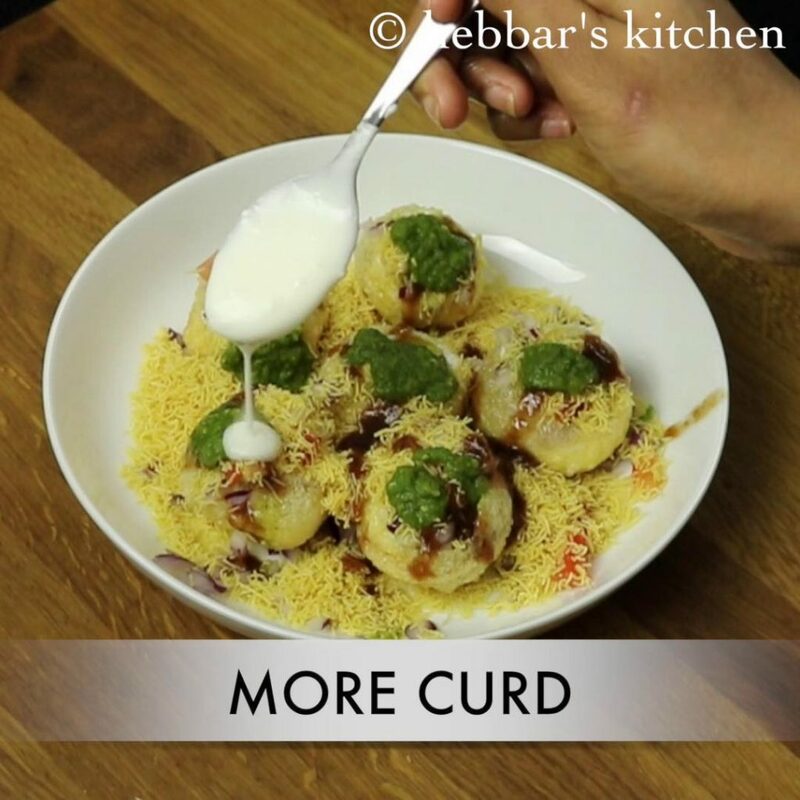 furthermore, using thick and creamy curd gives nice flavour. also adjust the amount of chili powder according to spice level. finally, dahi puri taste great when served immediately else they turn soggy.